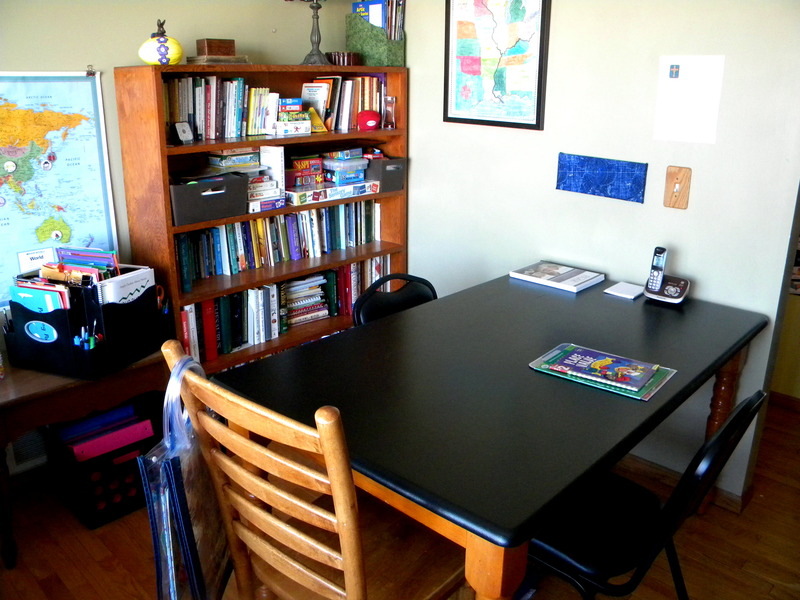 We actually have two rooms that we use for homeschool – one in our basement and the study on the main level. 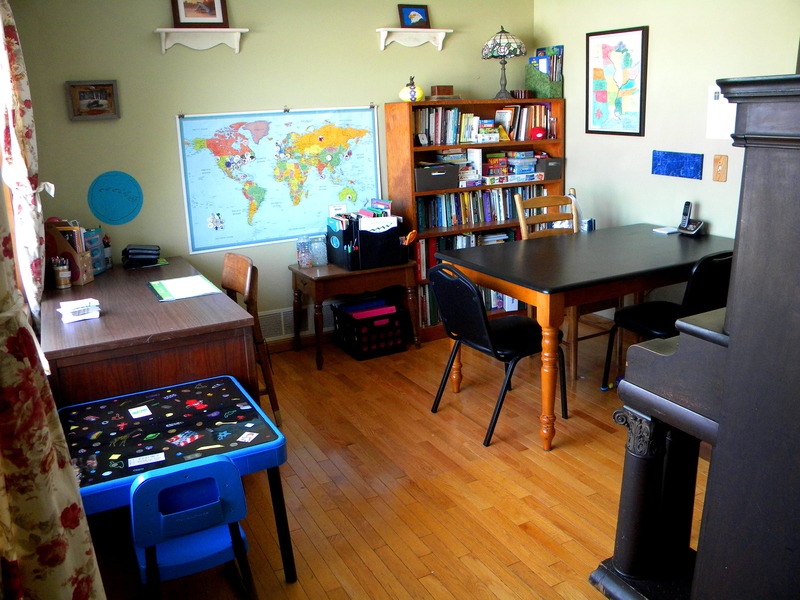 Our home’s main level is just shy of 1,000 square feet so many rooms serve multiple purposes. 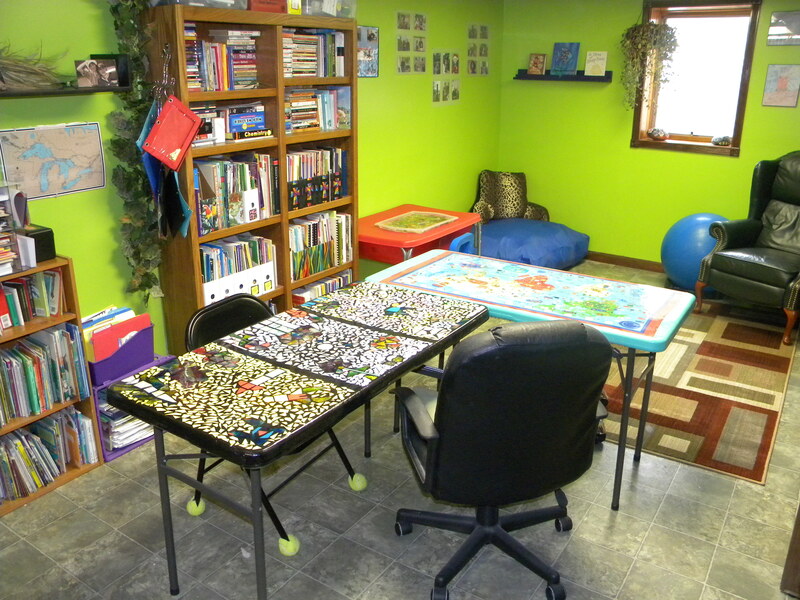 The school room in the basement is also used as a therapy room, sensory room, play room and sewing room. 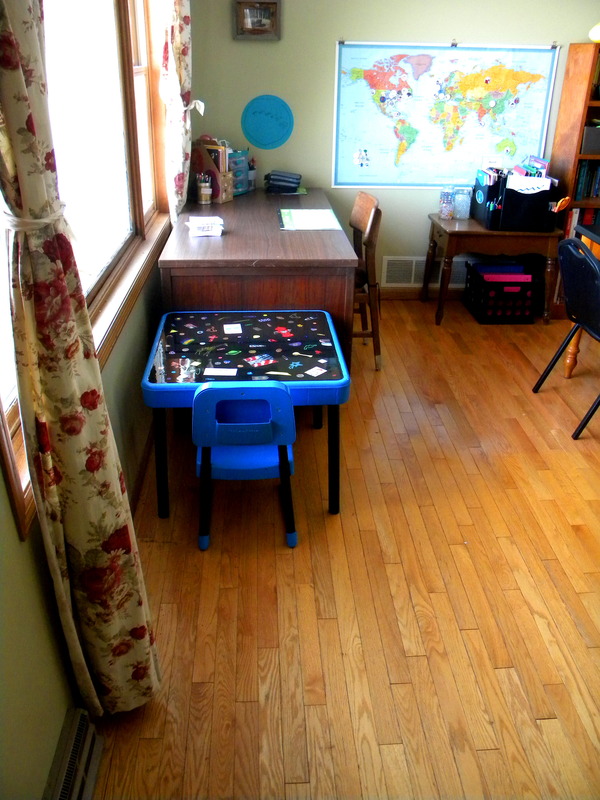 This is the sensory corner where the sensory table lives and in this photo we have the blue “crash mat” out as well. 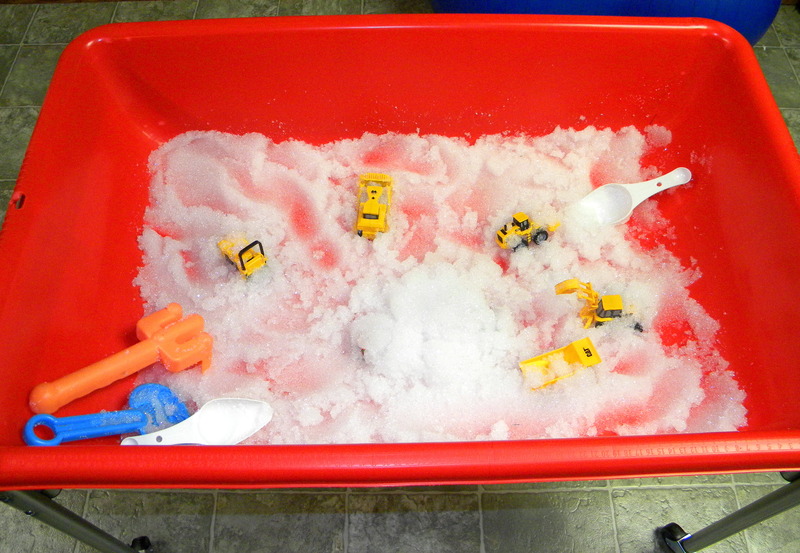 I change the theme of the sensory bin every week and alternate what is in the corner every 3-4 weeks (crash mat, trampoline, ball pit, etc.). Pathfinder is usually on the wall below the book ledge. 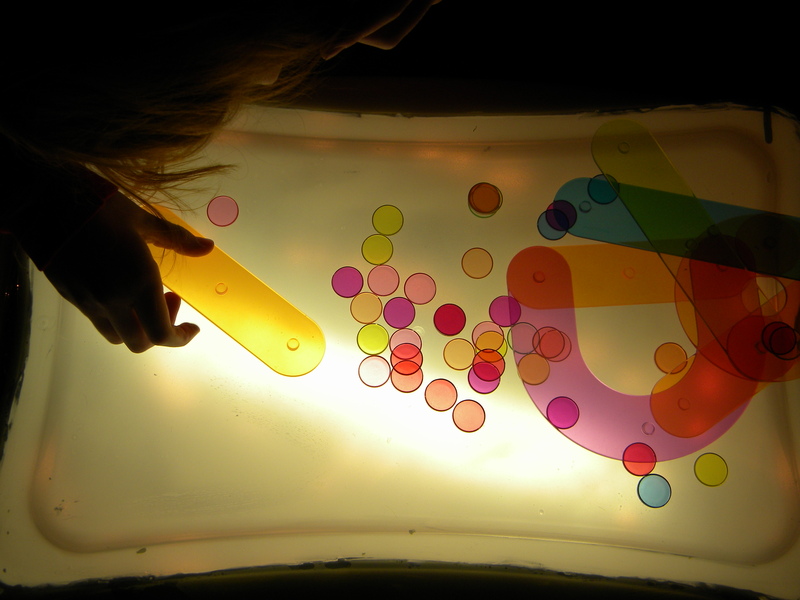 Light box and sensory supplies. 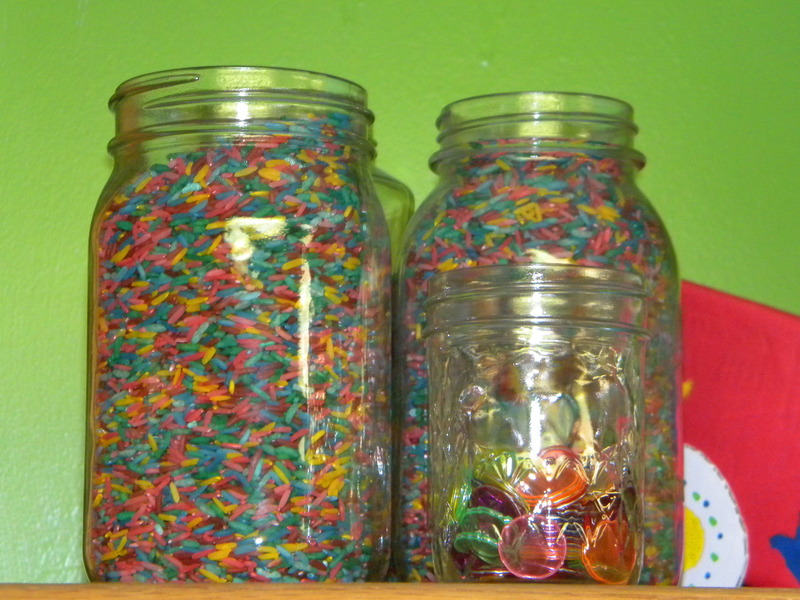 Colored rice and translucent chips in canning jars. 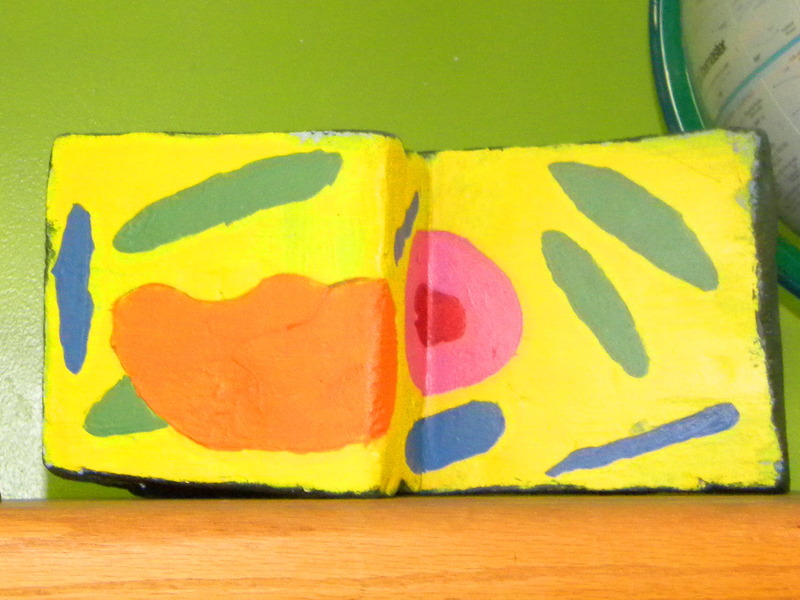 Plant cell model made out of scraps of rigid insulation glued together. Behind the curtain is a monstrous old entertainment center turned into a sewing cabinet and storage for large items like globes. I keep patterns in Ikea baskets and fabric on little bolts of foam board. 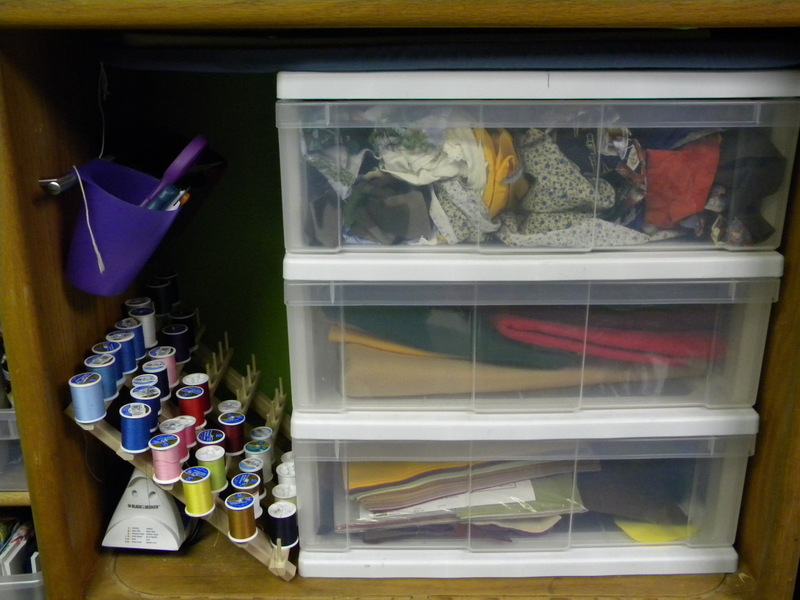 I have a large drawer unit (where the TV would go) for scraps and felt. An Ikea Bygel rail and cups installed on the side allows for easy access to the most used items. 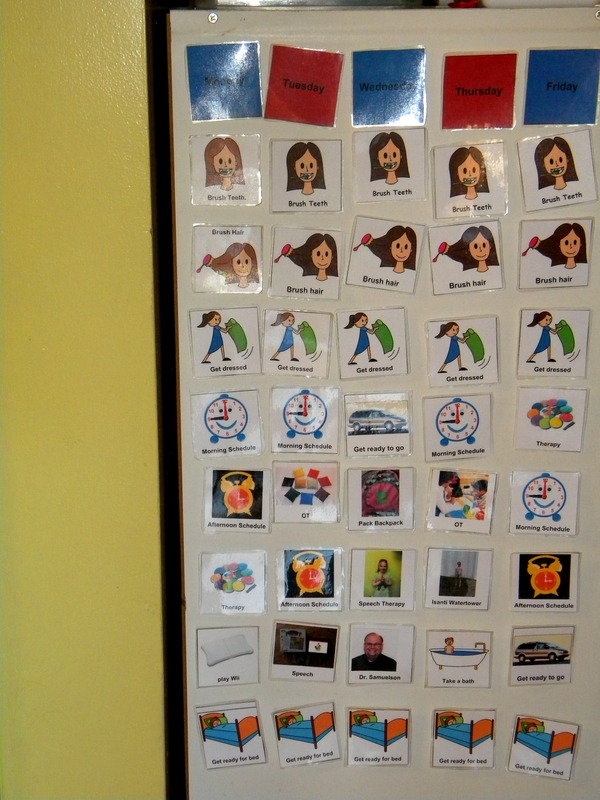 We use folding tables for our work area because we need to be able to quickly and easily move the tables to make room for therapy and other activities. The gray tops were not very inspiring so I painted one teal and decoupaged a cute fabric map on top, then covered with epoxy resin. The other table was painted black and the younger children were each given a third of the table to create a mosaic design. 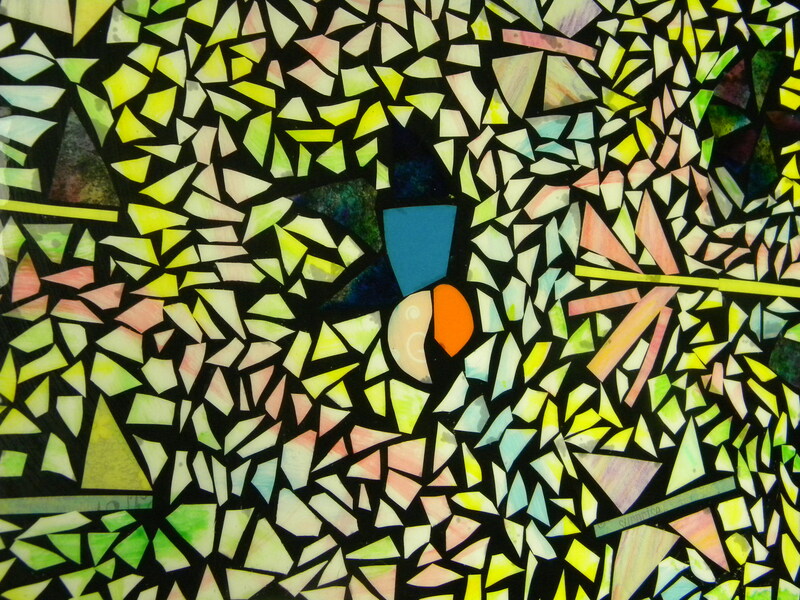 The “glass” is cut up scraps of cardstock and watercolor paintings. 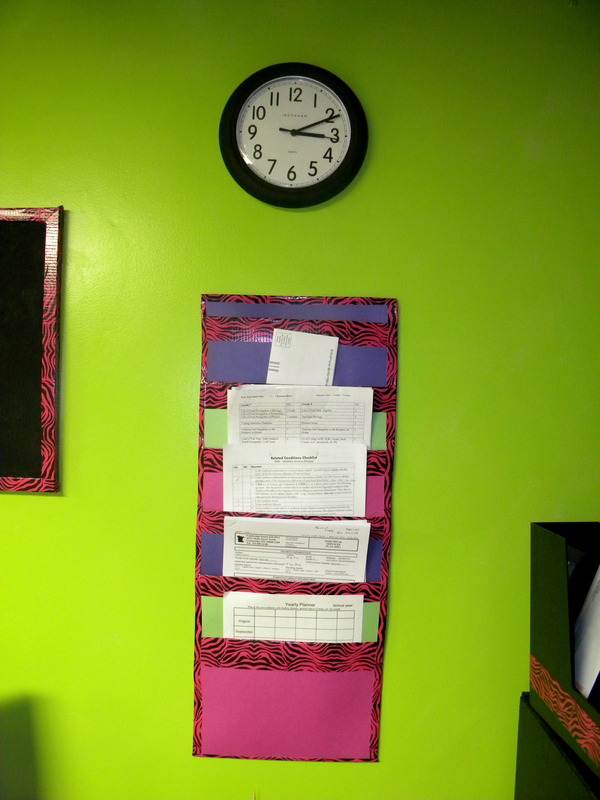 Hanging storage out of file folders and duct tape. 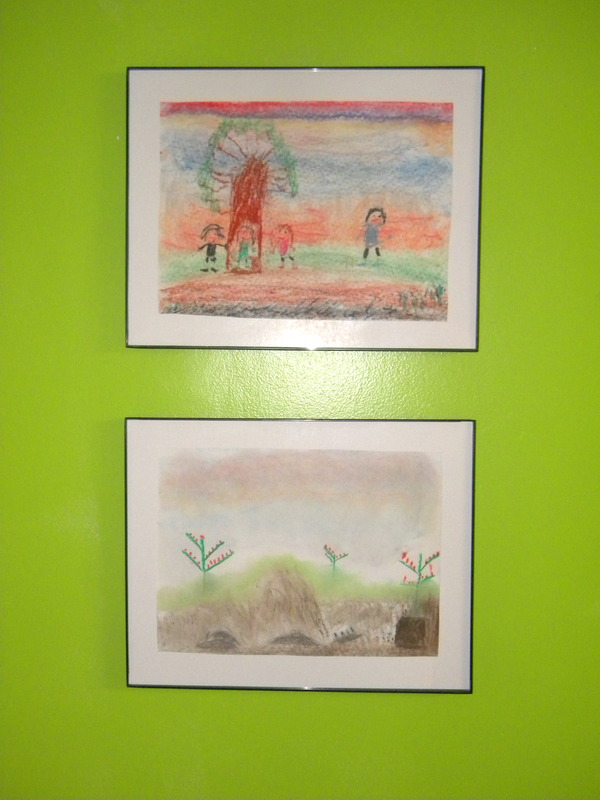 Children’s art in easy front load frames (Wal-mart). Storage unit painted black on turned to the side stores frequently used items. The side and what would be the back have black hooks and magnetic strips to hold headphones, adaptive mouse, PT exercises and more. 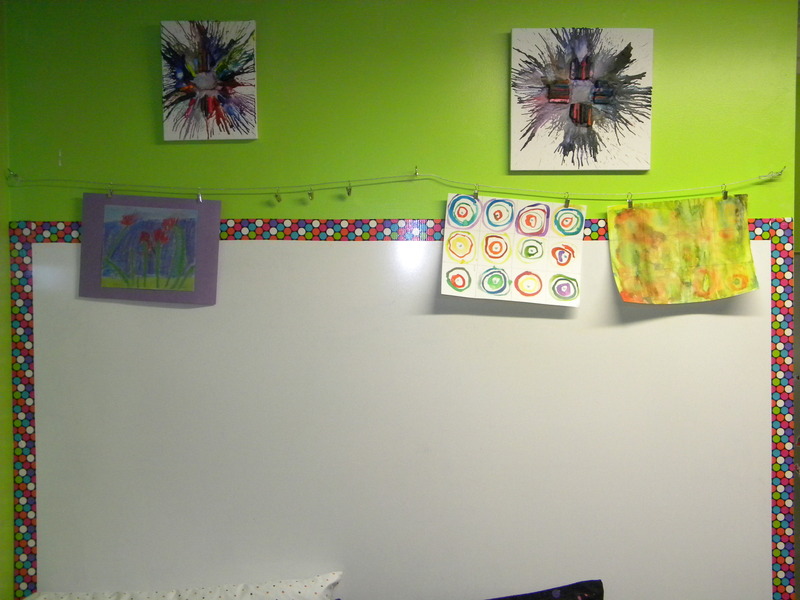 White board (made from inexpensive shower board and duct tape) with Ikea picture wire and clips above for displaying artwork, maps and charts. Stairs leading to the schoolroom are painting in contrasting colors with shredded rubber added to the paint to create a non-slip surface. Ikea grip strips and handrails on both sides of the stairwell help L safely maneuver the stairs. Oil pan screwed to wall for magnetic play. Ugly storage cabinets updated with paint, new hardware and chalkboard contact paper. 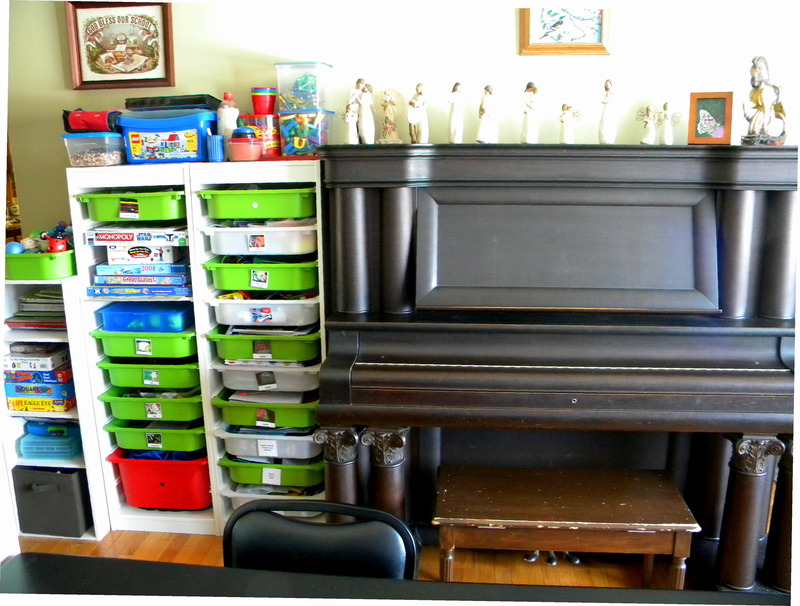 Puzzles, art supplies and teachers manual are stored inside. Next to the white cabinets are five bookcases. The short bookcase in the middle houses picture books and easy readers with paper storage above. I keep file folder games in the purple crates and the pieces in binder pouches hooked on (what I think are belt?) hangers. 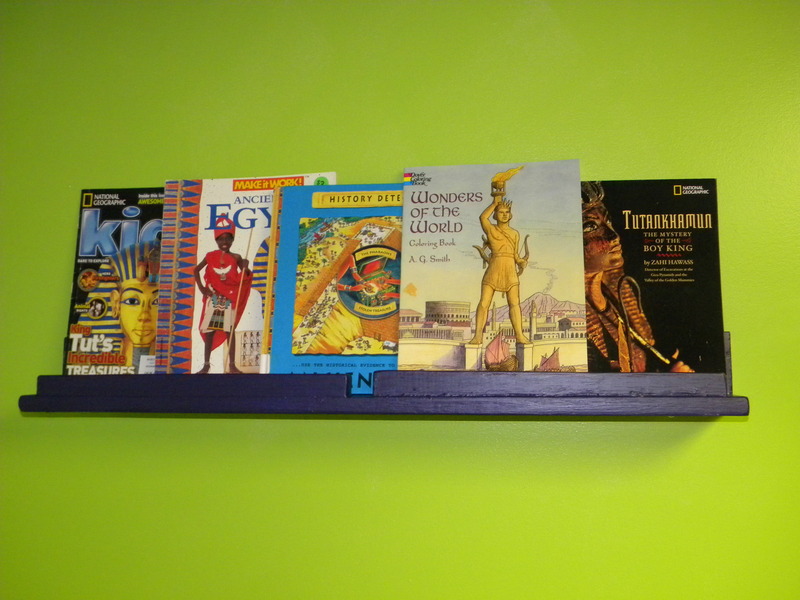 This bookshelf houses FIAR and geography (above) as well as history and reference materials. The bookcase to the left holds science, art, bible and chapter books to be assigned during the year. Spinning shoe rack for puppet storage. 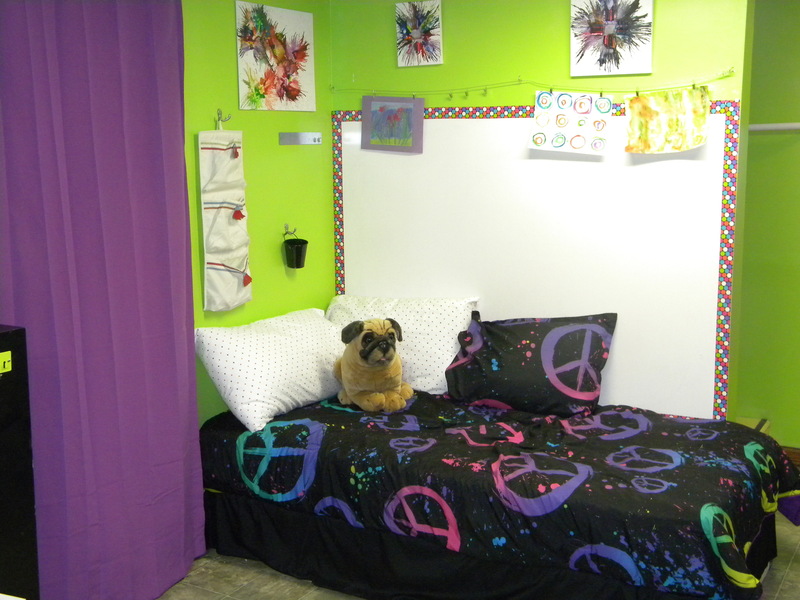 Additional views of the school room and set up for therapy. This bookcase holds current read-alouds, library books, poetry, cookbooks, field guides and educational games. Can you believe my dad built this in junior high shop class? 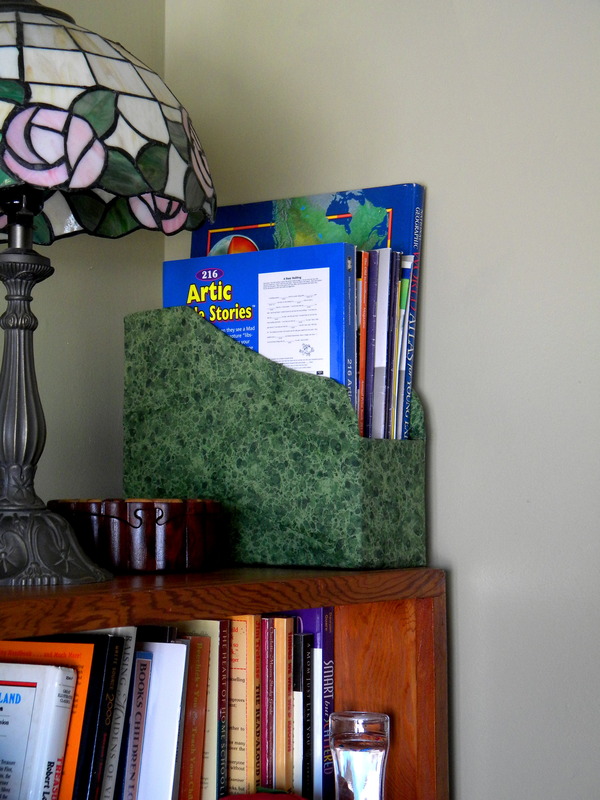 Oversized book holder made out of a shipping box and fabric scraps. Small bulletin board made from foam board and fabric. 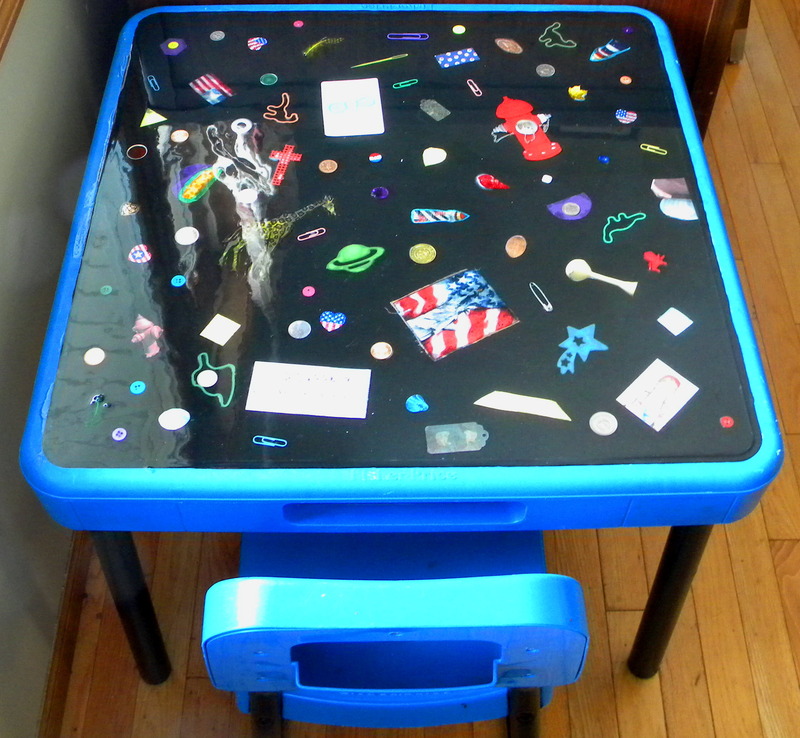 J’s desk – old Little Tykes table painted and embellished with her favorite things (flags, watertowers and fire hydrants) and covered with several coats of epoxy resin. 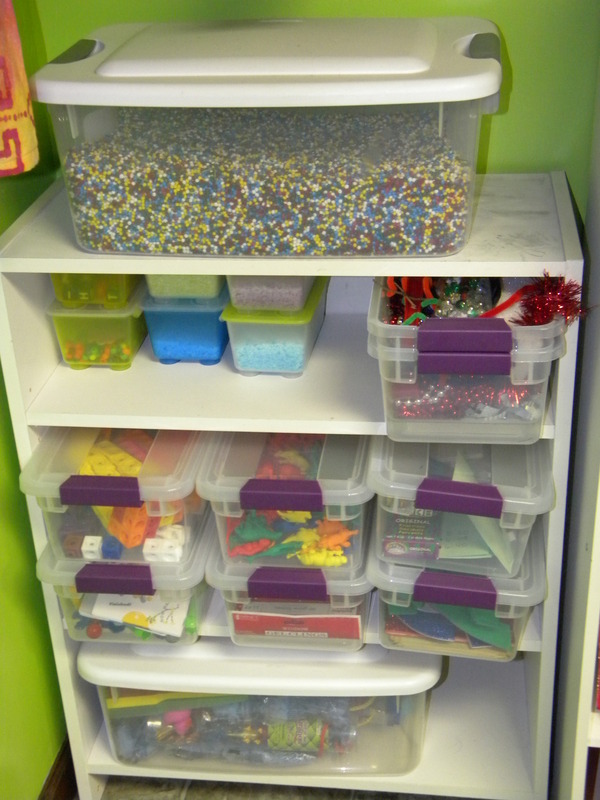 Ikea Trofast storage holds pencils, scissors, fidgets, chewies, OT supplies, and math manipulatives. 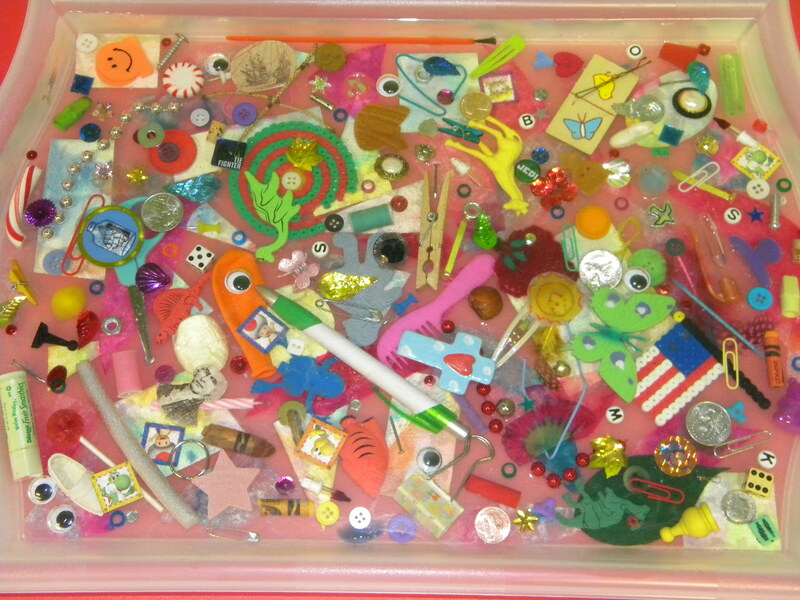 Photos of each drawer’s contents are laminated and attached with velcro to help the children put away their things. J’s weekly schedule is attached to the side of the Ikea unit. 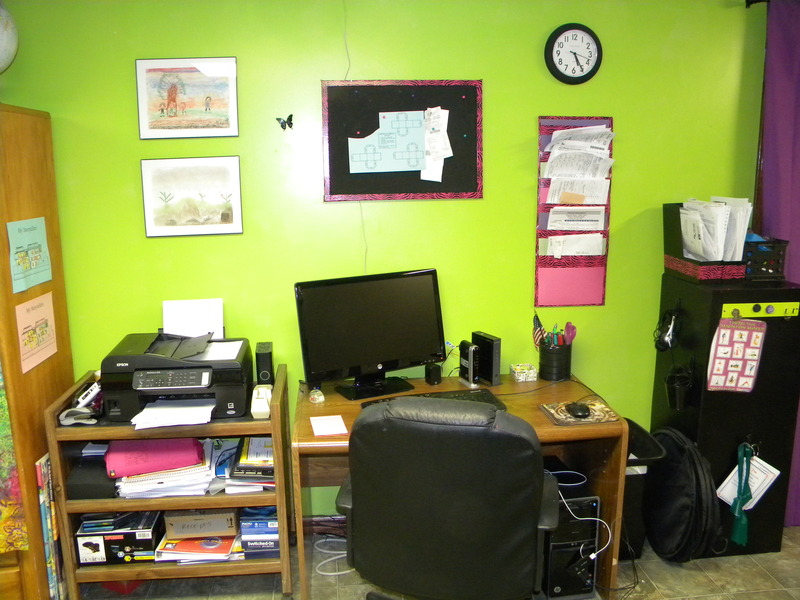 C has a large desk with lots of storage. 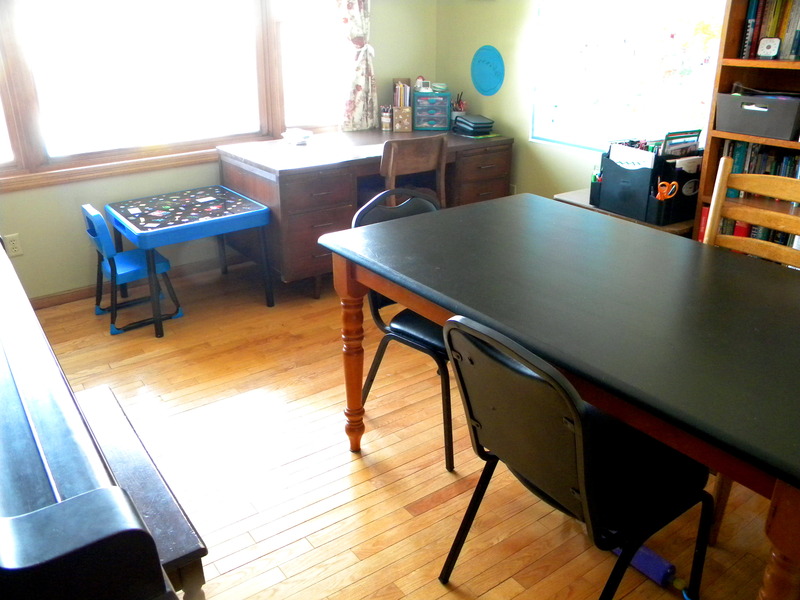 We also consider our yard as part of our homeschool space, especially in the summer! WOW, WOW, WOW! I am inspired!!!!! Love your space. AMAZING organisation! 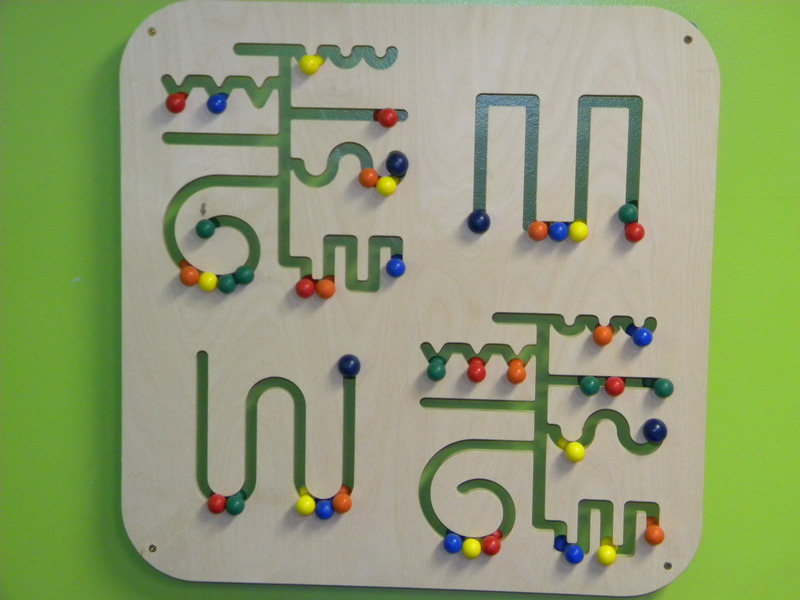 You have obviously put so much thought and effort into making this space work for your family – it’s wonderful. I especially love the crash mat (my SPD son would love!) and book ledge. I love your school spaces. You have so many great ideas! You have really inspired me.